Developing or Revising Your Mission Statement? A strong mission statement is vital for nonprofit organizations. Whether you are still in the process of creating your organization’s first mission statement or if you are reviewing and revising an existing statement, try these tips to ensure a productive process and a strong result. 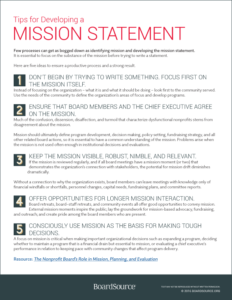 This resource provides ideas not only for drafting your mission statement, but also for ensuring your board and staff are consistently referring back to the mission statement.